Mile-a-minute weed (Persicaria perfoliata) is an invasive species in the Polygonaceae (smartweed) family that is native to Asia. It is believed to have been introduced to the United States in the late 1800’s and early 1900’s, but the initial introductions failed to form permanent infestations. The plant is suspected to have become permanently established following introduction to a plant nursery in eastern Pennsylvania in the 1930’s or 1940’s, possibly with imported rhododendron plants. Since then the plant has spread westward; the most recent USDA map indicates infestations in the mid-Atlantic states and west to Ohio and Kentucky. EDDMapS indicates an infestation in one Indiana county. MAMW is also found in Oregon. A landowner near Knoxville, IA contacted the Marion County Extension office regarding a weed after a friend tentatively identified the plant as mile-a-minute weed (MAMW). The landowner had been battling the plant for three years, and believed he was starting to lose the war. 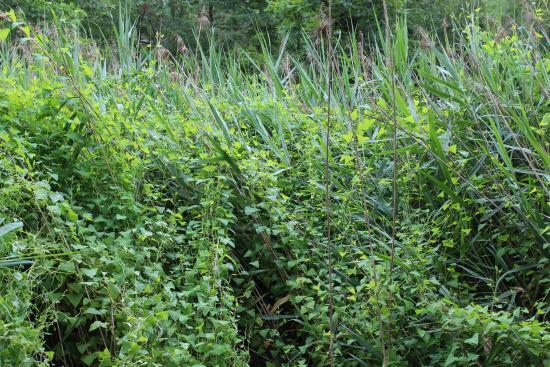 We, along with a representative from IDALS, visited the site on July 19 to confirm that the weed was indeed the invasive plant not known to be present in Iowa. Once we arrived, it was clear that the plant was indeed MAMW. Mile-a-minute weed climbing and pulling down ornamental miscanthus at the first known infestation in Iowa. 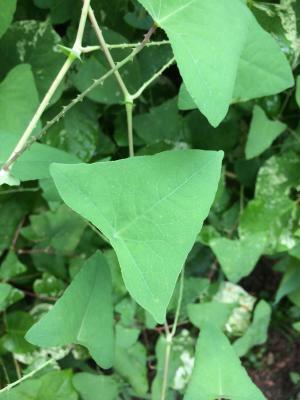 MAMW has several unique characteristics that differentiate it from other vine weeds in Iowa and simplify its identification. These traits include: leaves shaped like an equilateral triangle; short, curved spines on stems and petioles; circular ochrea at leaf nodes; and small blue fruit produced in clusters, each containing a single seed. Like most members of the Polygonaceae family, the white flowers of MAMW are small and inconspicuous. The plant is adapted to wet areas with full sun, and frequently invades forest edges, stream banks, and roadsides. It is not considered a threat to agricultural fields. The plant is spread locally by birds consuming the fruit. Since the plant is not known to be in the region, it is likely the introduction to this site was facilitated by human activities. Our best guess is that seed of MAMW was brought to Iowa via plants purchased from a nursery in a state infested with MAMW. The infestation was located at the edge of a wooded area and well-maintained gardens. We did not find presence of MAMW in the wooded area with deep shade or along a stream below the property. Although this was our first encounter with MAMW, it was easy to see why the plant is considered a threat. This infestation was less than a quarter acre in size, but it was crowding out existing vegetation. The weight of the plant was pulling down a stand of miscanthus, a species known for establishing monocultures. There is no easy method to eradicating weed infestations, whether it is mile-a-minute weed, Palmer amaranth, or Canada thistle. It appears this infestation had been present for at least five years, thus there will be a large seedbank present. Studies have shown seed can survive for at least eight years, and management will take a long-term commitment. The landowner has used postemergence applications of glyphosate and growth regulator herbicides. While these are effective, the prolonged emergence patterns will require multiple applications during the growing season. These products also will damage other plants in the area, opening the site up for invasion of other weeds or new flushes of MAMW. The plant has a small root system, so hand pulling is a relatively easy (gloves are recommended due to the spines) and effective way to remove plants. While this is the first discovery of this invasive species in Iowa, humans are extremely effective at inadvertently moving invasive species to new locations. If you find MAMW or another weed you suspect to be an invasive species, please contact us for information on identification and management. Triangular leaf of mile-a-minute weed. 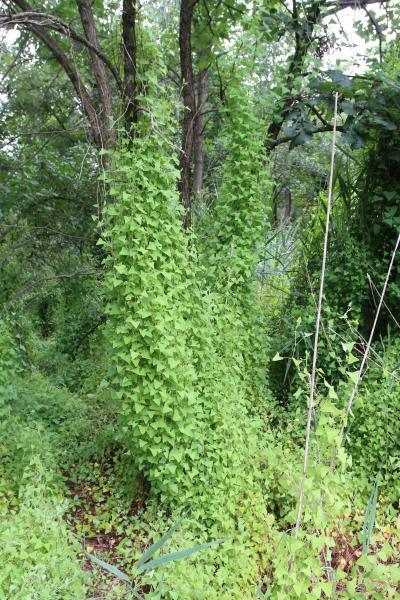 Mile-a-minute weed is capable of smothering plants in infested areas.